Is networking bad for your health? Are you a networking nerd? The type of business person who packs out their calendar with one event after another, aiming to be in the social pages at least once a week? If you are, you might consider this: Too much networking can be bad for your health and wellbeing. It can also be super bad for business. This may sound nonsensical to many since we’re taught to believe that networking is a great opportunity to sell yourself and your services. A chance to get your foot in the door and a chance to get your business card circulating. Here are Kim’s top 10 tips for how to avoid being a networking nerd. Don’t network for network’s sake. Be strategic so your efforts align with your interests and business. Before you book, ask yourself what the connection is. If you don’t know, don’t go. Network with the right attitude. It’s not about what you can get out of the experience but what you can share. This is the most effective way to make a great impression and encourage others to want to get to know you. Go in armed with a sense of curiosity and ask open-ended questions to generate interesting and stimulating conversation. You’ll be surprised how much you’ll learn. Avoid the hard sell about you, your talent and your services. It’s often boring for others and makes you sound, well, nerdy. It’s also one-sided and you risk sounding arrogant. Pace yourself so you don’t get wiped out from spending too many hours outside work shaking hands instead of spending time on you, your family and friends. Eliminate the jitters that can arise when you feel you must prove yourself over and over at a networking event. It’s not a glorified form of competition so don’t hesitate to talk about interesting topics other than business. Avoid controversial issues that can get you in trouble, like religion or politics. 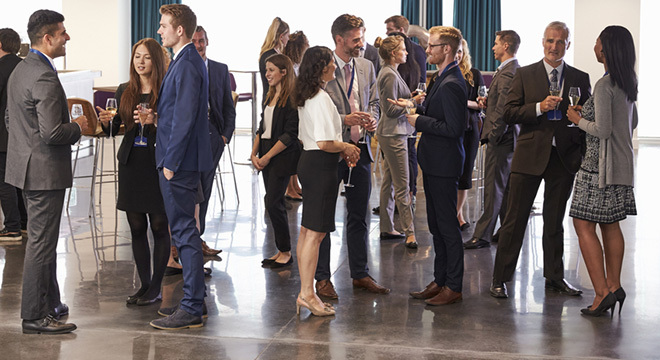 Seek out networking events that are less structured and formal, so you can enjoy being relaxed. Have fun by scheduling in the odd ‘wildcard’ networking function that isn’t even remotely connected to your line of work, but rather an opportunity to meet new people with new viewpoints. Don’t apply a formula follow-up; you know, rushing into the office at 7am the next day to crank out ‘thank you’ emails and being pushy about setting up an appointment to present or sell. Chances are you’ll offend more than anything else. Instead, concentrate on catching up over real life, interesting opportunities. Kim runs Kim Vella Coaching and says many professionals she coaches and sees in her leadership workshops feel obliged to network, even though they’re on some level nervous about doing so. “Many are worried whether they’re credentials are good enough or concerned about having to continually prove their worth,” says Kim. “This is why seeking out conversation that’s more about the person you’ve just met rather than yourself is a valuable skill.